No breakfast is more complete than the one which consists of eggs, spinach and baked salmon neatly served over a bed of spiced baked potatoes. When the flavors greet each other with a special kind of fondness, and you just know that your morning will be alright, especially with a steaming mug of coffee or herbal tea next to your plate. Grab all the energy you need and toss those taters into the oven, because we know deep down that you deserve to feel energetic all the day through. So where is that much vitality coming through? Well, for starters, there is plenty of spark in the smoked salmon. Nutrient dense and rich in Omega-3 fatty acids, salmon should make the occasional, if not weekly appearance, in your life. It is a wonderful source of protein that is easy to digest, at the same time it is abundant in B vitamins – good for your brain and beneficial for your heart too. There is plenty of staying power in the eggs, and the yolks are essential to your wellbeing. Skip them if you must, but we know from experience that eggs keep us full and satisfied for many hours of the day, and they also make a great travel food – just in case you need breakfast on the go. If you love this dish, we know that you will likely be able to devour a feast of sweet potato rosti with smoked salmon too. Dice the potatoes, then drizzle with olive oil, onion powder, garlic powder, paprika, and season to taste. Place the potatoes on a baking dish, and bake in the oven 25 to 30 minutes, turning at the halfway point. Add the eggs to the boiling water, turn off the heat and cook 6 to 7 minutes. Drain the water and run cold water over the eggs; peel the eggs and set aside. Melt the ghee over medium-high heat and add the onion and garlic. Cook 1 to 2 minutes, than add the sliced mushrooms. Season everything to taste, and cook until everything is soft, 4 to 5 minutes longer. 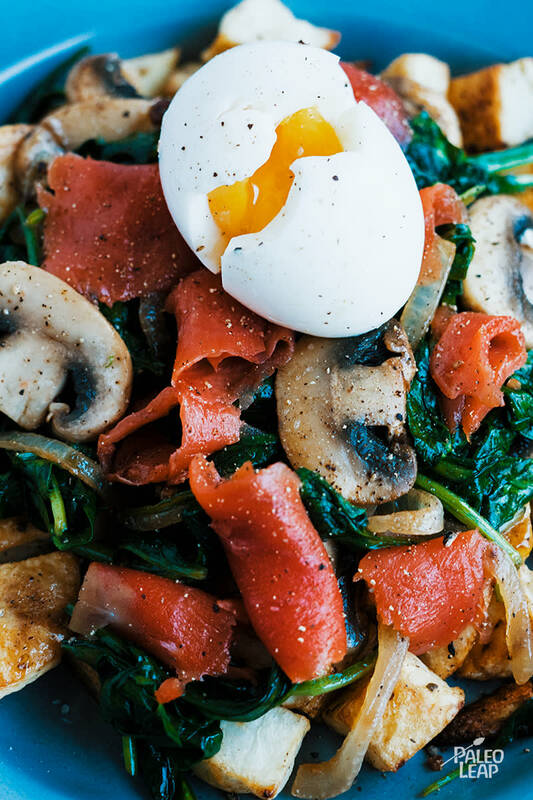 Serve the potatoes, topped with the spinach-mushroom mixture, egg, and sliced smoked salmon.